I also fixed a bug about proper management of negative (southern) longitude values. Many thanks to Dave Typinski for the additions/corrections/phase plane probability map I added the various edits to paragraphs "Which kind of signals could I receive ? ", "A bit of scientific background", "About CML-Io Phase Plane Probabilities". I updated the software used in this project to use a different FFT library and different file format for improved performance and reduced storage space. All the software has been built and tested both on Raspberry PI 2 and 3. It runs well also on a Debian Jessie virtual machine. rtl_power_fftw can be compiled also on Windows but I did not try this yet. Amateur radio-astronomers built several devices in order to receive, listen and/or display signals from outer space sources, many use custom made radio receivers, others use HAM radio receivers. Recently, various experiments have been done using the cheap rtl-sdr dongles (radio receivers originally meant to listen radio and watch TV on your laptop). With this project I want to try receiving radio emissions from the Sun or Jupiter and its satellite Io. 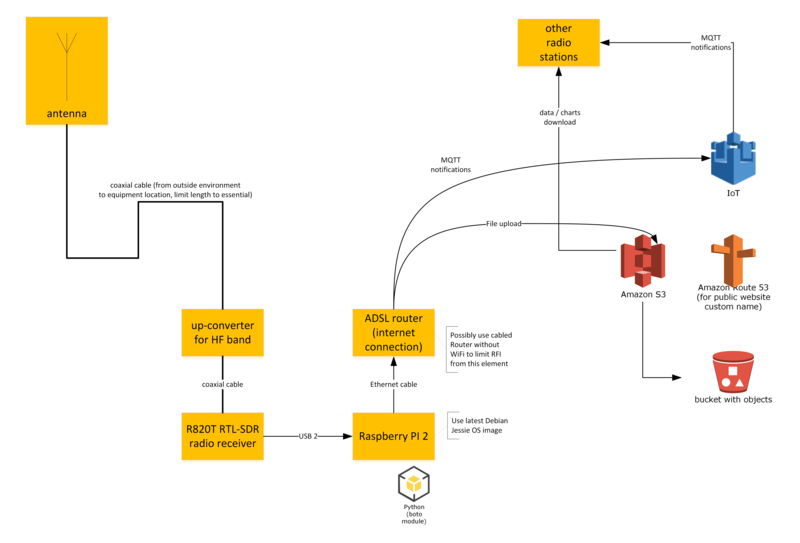 I want to build an automated radio station, cloud connected as an IoT device that any amateur could easily replicate, joining the project and forming a collaborative, open science effort to easily share the spectrograms of the received emissions. Which kind of signals could I receive ? It is very easy to receive Radio Frequency storms from the Sun, but also Jupiter produces strong RF emissions. You can receive radio emissions from these sources on different frequencies. The upper part of the HF band ( between 10 and 30 MHz ) is often the target of scientific monitoring for both Sun and Jupiter. Many other frequencies can be monitored up to 1.7 GHz with these radio dongles but I will focus on the HF band with this project. Jupiter decametric radio emission, first discovered by Burke and Franklin in 1955, can be received between 15 and 30 MHz with a modest antenna array. The Earth's atmosphere attenuates the emission progressively more the further one looks below 15 MHz. Jupiter’s magnetic field strength limits its decametric emission to a maximum of slightly under 40 MHz, but Jovian emission also gets weaker the higher one goes in frequency. Most Jovian emission above 30 MHz is weak, requiring large antenna arrays to see it. You can read the whole story of the discovery of Jupiter’s radio storms on the wonderful Radio Jove NASA website . On the same website you will find the description of a very good dedicated radio receiver on 20.1 MHz . The tuning frequency is not very critical since the radio storms can be received across most of the HF spectrum. The emissions are produced by the interaction of charged particles with the Jovian magnetic field. The Jovian magnetic field is about 20,000 times stronger that Earth’s. As with Earth’s aurorae, the Jovian magnetic field is responsible for aurorae formation in Jupiter’s upper atmosphere (like pictured below by Hubble). The Jupiter emission observed in the HF band does not come from the aurorae, but from a region around 20,000 km above the visible cloud layer. The relative geometry between Jupiter, its satellite Io, and Earth has been observed to have a modulating effect on the emission, making it more or less likely to be observed at different times. There's a probability distribution chart that you will find in various scientific papers that has been built based on years of data logging since 1957. Data is still being collected and the probability parameters updated. The plot above, called a CML-Io Phase Plane Probability Map (or just “phase plane” for short), is an adaptation from the probability map used by Radio Jupiter Pro. Central Meridian Longitude tells us what part of Jupiter is facing Earth, while Io Phase tells us where Io is in its orbit relative to superior geocentric conjunction (the point in its orbit furthest away from Earth, directly behind Jupiter). The zone boundaries (with the exception of Io-D) are marked according to the University of Florida Radio Observatory (UFRO) definitions; see https://ufro.astro.ufl.edu/decframe.htm . UFRO does not define an Io-D zone, so the Io-D zone is marked according to the definition provided by Carr, et al. in “Physics of the Jovian Magnetosphere” (1983). The Io-CML phase plane image above attempts to depict the relative probability of receiving Jovian emissions at 20.1 MHz. This is done by first making an average of probability data generated from observations made at 18, 20 and 22 MHz at the University of Florida Radio Observatory (UFRO) from 1957 to 1994. The resulting average is then scaled so that the peak probability, in the Io-B source region, becomes 100% relative probability. The probability of observing Jovian emissions is affected by many variables. Some of these are the observing frequency, transparency of the earth's ionosphere, duration of the observing session, antenna gain, receiver sensitivity, galactic background noise level, man-made noise level, position of Jupiter relative to the Sun, and the jovicentric declination of Earth. While this image is a useful guide for the Jove observer, it cannot be used to predict events with absolute certainty. Experience with small antenna arrays and swept frequency spectrographs shows that 100% relative probability is perhaps 50% absolute probability. That means even for the high-probability Io-B zone, one has only a 50% chance of observing Jovian emission when Jupiter, Io, and Earth are in such a configuration. Thanks to Drs. Chuck Higgins, Francisco Reyes, and James Thieman, for their assistance in making this UFRO data available, and to Dave Typinski for generating the phase plane graphic image above. 3D plot above is from Figure 1.4 in Higgins, A New Determination of Jupiter's Radio Rotation Period, University of Florida (dissertation) (1996). It represents observations made at the University of Florida Radio Observatory from 1957 to 1994 at 18, 20, and 22 MHz. On your Raspberry I'm providing a python script named jpredict.py (see my github code repository) that will output the predictions in text format. It's a port to python of an older QBasic program whose original source can be found at this web page together with good explanations about the theory and instructions to build a folded dipole antenna. Warning: that version will give general predictions, not specific to your observing position. So, if Jupiter is below the horizon for you when the program predicts emissions... it will be actually impossible for you to receive them. I heavily modified that version adding the wonderful python package SkyField by Brandon Rhodes, to calculate event predictions for your geographical position, you can specify latitude and longitude in file radioConfig.py . As I wrote in the introduction, in this project I'm focusing on a different approach to radio data collection: I will use an RTL-SDR usb dongle : It is essentially a consumer device originally designed as a TV tuner for DVB-T to be used on computers through a USB port. Signal strength is calculated by program rtl_power performing FFT transformations on the digital stream of data that comes from the tuner via the USB port. Different colours are assigned to the signal strength values plotted using a specified palette visible on the right. Note: version 2 of my python programs now use a modified version of rtl-power-fftw (see update note at top of this project page). the proposed design should work for most of the usual radio-astronomy frequencies. I will use the recommended 18-24 MHz frequency range, probably the most used one for Jupiter-Io radio storms. Why ? Because a wire antenna cut for 20.1 MHz has its own size and needs to be positioned properly. If you don't have the necessary space you should consider an alternative frequency. A very good example dipole antenna design can be found on the NASA radiojove website here together with important information about Jupiter position, visibility of the source from your site, etc. You can find the wire length for the dipole calculated inside the pdf: it's 7.09 meters , consider the length of the rope guylines for the masts to have an idea of the free ground space you need to setup the antenna. Important: the only difference in my usage of this antenna design is to use an SMA male connector on the receiver end of the coax cable. This because the upconverter and many of the SDR radios use that connector type. Another constraint is given by Radio Frequency Interference. I would suggest you start doing a "survey" of your selected antenna site to see how much RFI is present and on which frequencies. You can do this connecting the RTL-SDR to your laptop and using free sw like SDR# to watch/listen the whole spectrum. If you see that too much radio interference is present, you can choose a different location for your antenna, add proper filters between the antenna and the receiver or change the target frequency of your research. In some cases you simply cannot proceed with such a project: it can happen in highly populated urban or industrial areas. As they say... your mileage may vary. When I run the first scans, I've noticed a lot of radio interferences. I've used the instructions on this web page to reduce most of the RFI I was getting in my receiver / logged data when using the first dongle I purchased (with plastic case, then I purchased the latest with metal case and TCXO). The RTL-SDR can tune to a wide set of frequencies, starting from about 24 MHz. Since we are interested also in frequencies below 24 MHz, we need an up-converter. It's a simple circuit that "shifts" the RF up by a certain amount so that becomes receivable by these dongles. You add it between the antenna and the RTL-SDR. In my case I've used one that shifts by 125 MHz so, when you tune the dongle to 145.1 MHz you are actually tuning it to 20.1 MHz . Important: should you decide to work at a different center frequency, higher than 24 MHz you can obviously avoid purchasing and using an up-converter. Find below a picture of my SDR UP-100 made by Adam 9A4QV. Unfortunately it's sold-out but you can purchase any other like this for example. Please note that the upconverter usually has an input low-pass filter, in this case allowing input frequencies in the range 1.8-55 MHz. This is important because it can constraint your research frequency range but is also protecting your receiver from the powerful FM stations working at 88-108 MHz that can be really disturbing depending on your position. Please note that I used SDR# only for my surveys, it's not needed for running this project that is based on R-PI-2 + AWS cloud. The radio jove antenna manual explains how to buildRF cables soldering connectors. Should you encounter any difficulty, I suggest you search youtube for videos: you will find nice instructions about soldering RF connectors. Please follow the instructions below in the sequence they are presented. Some of these commands will ask you confirmation: reply yes when requested. If you already have the latest Raspbian Jessie OS ready on a suitable microSD you can skip to the next block "Prepare the development environment". in this way you prepared the development environment and downloaded the open source sw tools for the RTL-SDR radio that will be used to run the scans. at this point the sw has been built and installed. this will test the possible tuning range and packet loss if any. It will automatically find the dongle device and start the test. If you get errors please check the previous steps. Ever since we want to avoid producing additional RFI, we should disable the R-PI-3 WiFi and bluetooth. We will connect exclusively using an ethernet cable with ferrites possibly at both ends. At this point you will be able to connect using the cabled network that is enabled by default. Note: first version of the radio station python programs used GNUPLOT to produce the spectrograms. Latest version does no longer use GNUPLOT and instead, makes use of matplotlib, a python module that is smaller to install. Go back to the home folder to install the MQTT module for python and the datetime tool to force clock sync with NTP servers (more on this few lines later). The Raspbian image comes with NTP daemon already installed with default configuration. This means that you will get the date/time updated within few minutes from boot. Without going too much in detail, let's say that you can configure your preferred servers so that it can reach them with the shortest possible network delay. I have the Italian official atomic clock source at 40 Km so I will configure its 2 NTP servers on the R-PI. You can search the web to find out yours closest one. Why I'm doing this ? Having the data properly time stamped is important when you have to compare your data with that produced by others and having it precise enough is a good start. # Specify the percentage of bins to be discarded on each scan. # It will actually be half on each side of a single scan. integrationScans = 0	# see rtl_power_fftw documentation, this is the number of scans that will be averaged for integration purposes. Allows to integrate for less than 1 second. In order to send notifications using MQTT, you need 3 IoT certificate files to be in the same folder of my python programs. If you wish to participate in the cloud based shared experience just get in touch with me and I will send you those 3 files. If you don't want to send notifications just edit radioConfig.py to leave sendIoTmsg = False . In the family picture below, you can see all the devices. The DSO on the background is not mandatory, I've used that to run some checks for a possible extension of this project. There are more pictures, click on the right to go through all of them. At this point you will be ready to connect to your R-PI using a tty console program like Putty if you are working on Windows or just your terminal session if you are working on a Linux machine. Here are some photos of my old custom power source. It uses a transformer plus the usual rectifying bridge, condensers and a 7805 regulator. very very low ripple, high stability no RFI (like I'm getting instead with various switching power sources like phone chargers and similar). You can use any good quality power supply with 5 V and 150 mA output (the upconverter and any other experimental addition like a LNA will easily stay below 100 mA. I'm not going in detail on this since it's not core to this project. Please have a look at the radioConfig.py file where you will find all settings explained. This command will force the already mentioned NTP time sync and then start the main loop managed by doscan.py . This program will use the radioConfig.py parameters to run the rtl_power tool and to asynchronously plot the spectrograms. During the scan sessions, the R-PI will save on the microSD the output of rtl_power in chunks of 30 minutes (default config that you can change). g35 is the gain used by the receiver. Acceptable range is 1 to 49 . Using 0 is not suggested since then dongle will switch to automatic gain (= AGC on) and that is not used for this kind of measurements since it alters mesurements. As soon as the scan duration elapses, the .csv file is passed to postprocess.py that will run in parallel to prepare the file and plot it using gnuplot. The main execution will not wait for it complete and will immediately launch a new scan with rtl_power. This loop of independent operations will continue for all the time you configured in radioConfig.py . For example, with the following settings it will last for 10 hours (10*60 mins = 600) and will produce 20 files each with 30 mins of data. Depending on the config you entered, you will have all the spectrograms already pushed to the AWS cloud in S3 storage or just locally on your R-PI microSD. You can use a simple FTP for Windows program to download them to your laptop. An example one is WinSCP . If you want to give more scientific value to your data, you need to calibrate the receiver output so that it can be expressed in units of measure like db. I'm leaving this procedure to a future improvement if I will see good output and acceptable RFI to manage on my site. You can check your ability to send mqtt notifications using the 2 programs awsiotsub.py and awsiotpub.py (in this order): I kindly ask you get in touch with me if interested to get the IoT certificate files enabling this feature. All this effort could not have been put in place without the love and support of my beloved wife Chiara. Working on IoT, sensor fusion and Kalman filters since May 2014; Amateur (radio)astronomer; member of IEEE, ComputerSociety, ACM.